If I had my passport on me last week, I would have earned another stamp. I scored my first passport at 12, and my second when I was 17. My current and third passport expires next month. They're full of a variety of stamps from places across The Pond, but none from a place inside the United States. Let alone my own city. The city of Cincinnati is figuratively (and literally) divided into the East and West sides, separated by the Interstate 75 dividing line. 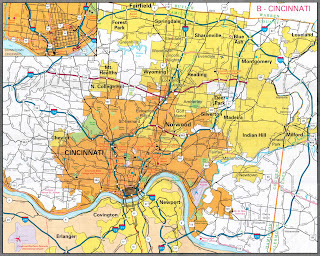 Native Cincinnatians will tell you there's a vast difference between the West and East sides. Old Cincinnati versus transient communities. The West's parochial commitment to the East's new money and mega McMansions. Die hard conservatism and, well, die hard conservatism. There are many differences between West and East, and rarely the twain shall meet, with perhaps the exception of Kenwood Towne Centre, which everyone agrees is the best shopping center in the area. It's a well known (and some cases, unfortunate) fact that folks from one side of town typically abstain from visiting/exploring/frequenting/supporting the other. Having grown up an "East Sider," I admit my knowledge of Price Hill, Colerain, Green Township and other points west is rather slim. Last week, I dipped my big toe in and spent a good couple hours in East Price Hill - it was eye opening. Ken Smith of Price Hill Will was kind enough to take 5chw4r7z and me on a tour of the area as part of a program exploring United Way's investment in Greater Cincinnati (full disclosure: I am employed by United Way) and the organization's commitment to the place matters initiative. Smith showed us neighborhoods striving to turn a corner and rise from economic depreciation and increased crime activity. These neighborhoods, block after block of 187os-and-newer homes, tease of stories of another time. A time when an incline carried people from the downtown basin to streets where people sat on front stoops and stopped by the corner market for the fixings of the family Sunday Dinner. You'd think time has taken the best days of these homes and neighborhoods, leaving behind sagging porches, overgrown bushes and garages on the brink of collapse. But community organizers are fighting back - renovating places worth saving and demolishing those homes beyond repair (but often still rented out by undiscriminating landlords). I enjoyed admiring the gingerbread trimmed homes, surprisingly stunning vistas and other features expected from a neighborhood with some history. It's interesting to look at the ebb and flow of Price Hill's past - and compare it to what may lie ahead for Cincinnati's suburbs. Price Hill was once a prosperous, bustling community - the city's most popular neighborhood, full of stately homes and social events. Cincinnati's growth pushed out in all directions, leading people to continue to build bigger/better/faster/stronger elsewhere. Communities began cropping up along the old 3-C Highway (Cincinnati-Columbus-Cleveland), drawing wealthy transplants away from the West Side. Neighborhoods west of the Mill Creek evolved and experienced a bit of a depression. No longer a destination for people in Greater Cincinnati, Price Hill has struggled with revitalization - until now. As people return to The Core and the older neighborhoods ringing the city, I wonder if the same thing will happen in years to come in outlying areas like West Chester and Mason.